New Visa on Arrival Scheme A Huge Hit. 421.6% Increase In Visas Issued! Indian Government had changed its visa on arrival policy last year, when visa on arrival facility was extended to 43 nationalities, along with speedy e-visa facility which ensured approved visa within 96 hours. It seems that the policy change has been well received by tourists, as 421.6% more visas were issued in the month of December, compared to last year. Ministry of Tourism issued a press release this week, which stated that due to change in visa in arrival policy of Indian government, a total of 14,083 new visa on arrival were issued in December, compared to 2700 last year, which translates to increase of 421.6%. For the period December-January, 39,046 visas were issued for foreign nationals, on arrival, compared to 29,294 last year, which translates to 92.4%. Interestingly, US accounts for maximum influx of tourists after the introduction of new visa rules, as 35% more Americans visited India, compared to last year. Russia with 15.06% is at #2 and Republic of Korea with 11.01% is at #3. If we analyze the Indian cities which received maximum foreign tourists under visa on arrival, then New Delhi is at #1 with 35.7% share. Mumbai is at #2 with 21.05%, followed by Goa at 18.24%. Tourism is Rs 2.217 lakh crore industry in India, which is estimated to rise to Rs 4.35 crore by 2022. Right now, it contributes 2% to National GDP as foreign nationals spend Rs 1.1 lakh crore in 2013, which will rise to Rs 1.74 lakh crore by 2024. This year, around 80 lakh foreign tourists are expected to arrive in India, and with the new visa on arrival policy being welcomed whole-heartedly, it seems that this number is all set to increase. Foreign nationals can apply for visa on arrival here. 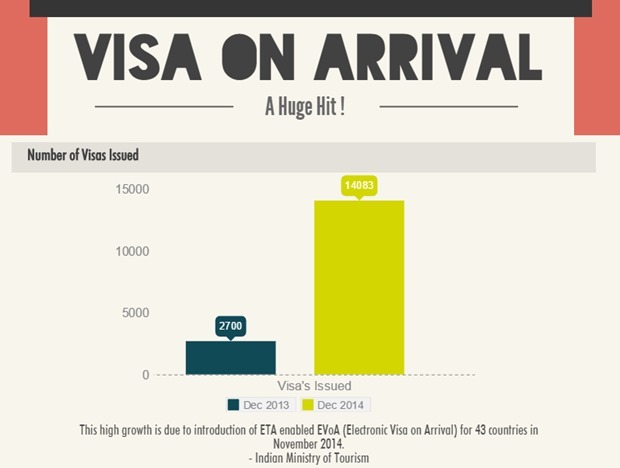 "New Visa on Arrival Scheme A Huge Hit. 421.6% Increase In Visas Issued! ", 5 out of 5 based on 1 ratings. Average IT Salaries Fall, But Still Highest. Edu Sector Pays Least! Mumbai Based Firm Creates Super-Affordable Chip to ‘Correct’ Radiations Emitted By Your Mobile Devices & Routers!